Late last fall, I registered through the Jewish Federation of the Berkshires to study the Book of Psalms with a partner from the Afula-Gilboa region of Israel. I was paired with a woman from Afula named Keren who could not start right away because she had just published a book. 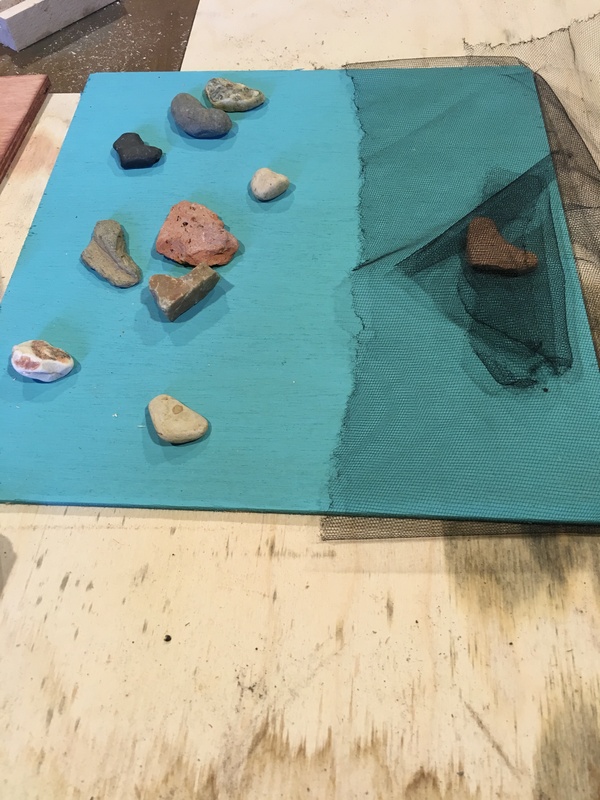 We began our studies while I was in Israel this past February, met in person (see my previous blog piece about that meeting), and concluded our weekly studies in early May, having bonded deeply. At this point, we were supposed to begin the “art” part of our collaboration for an exhibit that will be opening at the Mishkan Museum of Art in Ein Harod, Israel on October 25. 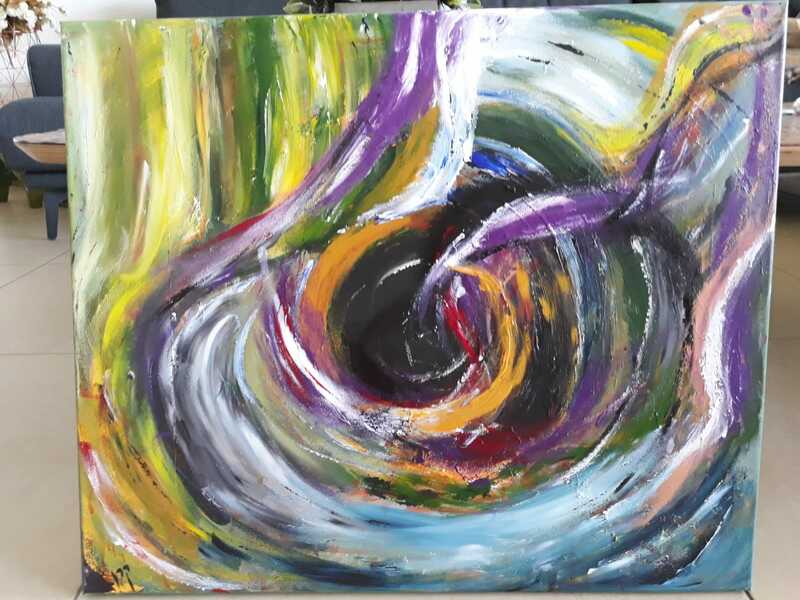 We were batting around ideas of what theme or themes from the Psalms to focus on in our art, since our pieces had to share a single written rationale and therefore be connected. In the midst of our deliberations, my brother Howard went missing (May 12), and it was confirmed that he died by suicide. I have spoken and written about that elsewhere and am not planning to use this blog to share more about those particulars at this time. However, it became apparent that Keren and I had been paired miraculously, fatedly, for this reason. Her book that had been published in January was about her brother’s sudden tragic death, and we had spent much of our studies with psalms of lamentation talking about grief and God and healing. While I was sitting shiva, Keren asked me what psalms I was sitting with. Of course, I was working extensively with Psalm 23 and that dark place we call the gei tzalmavet, the valley of the shadow of death, both in regard to my own grief and in trying to imagine my brother’s deep pain and suffering. She said she would do an art piece on that theme, and that I should, too. We wrote our rationale for the project which refers to the kismet of our collaboration, the deaths of our brothers, and the valley of the shadow of death. My friend Pattie lent me art supplies (I am not much of an artist myself and this project was a bit out of my comfort zone), but I soon realized that I needed to create a sculpture, not a flat piece of art. Following is the account of my project’s creation and its symbolism. It was just shipped to Israel a few days ago. I started by painting/staining the bottom and two sides of the box. These sides contain a 1/4 inch slot into which plexiglass will later be placed. The blue represents water and the black continues the theme of the valley of the shadow of death. The outside is stained sienna on all four sides. Red was Howard’s favorite color. Then I stained the two other sides both inside and out and wrote a different phrase from Psalm 23 on each. One says b’gei tzalmavet (in the valley of the shadow of death) and the other says Ata imadi (You are with me). I collect heart-shaped stones that I pick up while hiking. I now finally had a use for them! I chose a reddish heart-shaped stone, glued it down on what would be the bottom of the box and covered it with black meshy material. This represents Howard in the valley. 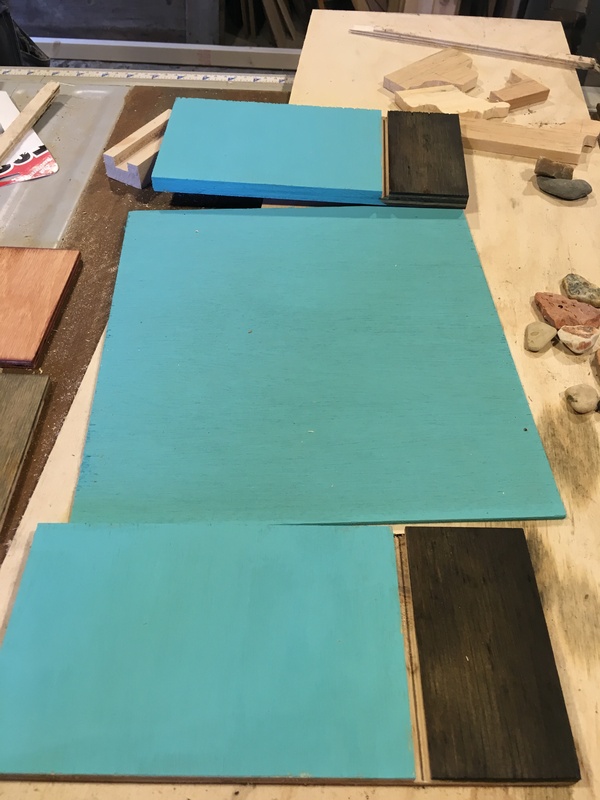 I also chose 9 other heart-shaped stones in different configurations (4 stones representing our family-of-origin sans Howard, 3 stones representing Howard’s nuclear family sans Howard, and 2 stones representing the larger community sans Howard*) and glued these stones to the floor board. In each case there is a missing “heart” that would complete the circle. Additionally, the 9 stones cannot constitute a quorum/minyan without that missing heart. * 3 is the required number of adults for both zimmun (invitation to recite the grace after meals aloud) and for a beit din/court. 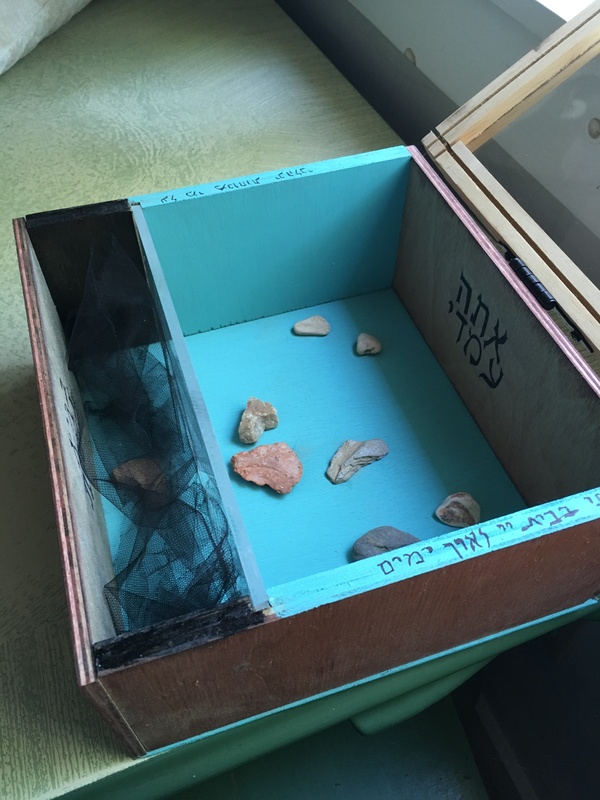 The four sides of the box are screwed together, the silver screws are painted with black nail polish, and two other phrases from Psalm 23 are written on the blue edges: one says Al mei menuchot y’nahaleini (God leads me beside the still waters) and the other V’shavti b’veit Adonai l’orekh yamim (I shall dwell in the house of Adonai forever). 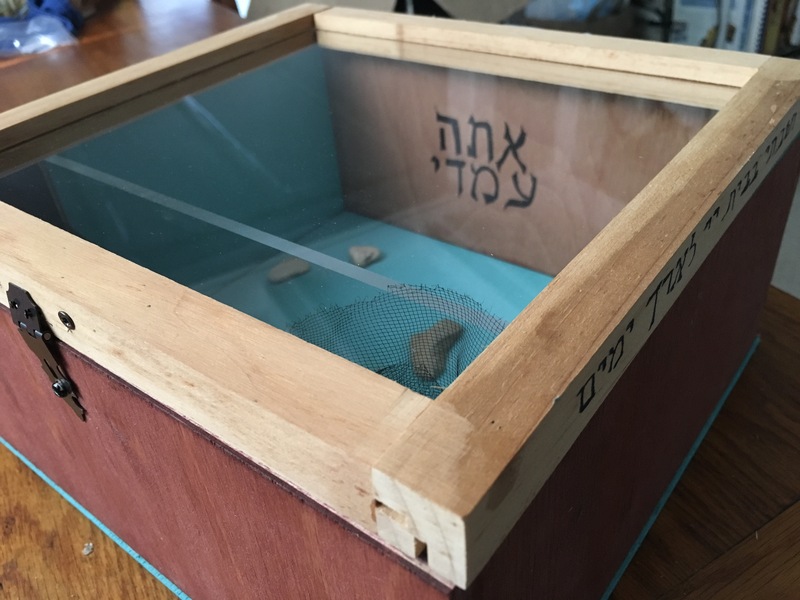 The bottom of the box gets glued into place, the plexiglass is placed in the slots (the transparent but solid wall separating Howard from those who love him) , more black meshy material is added to “the valley” through which the reddish heart can still be seen, and the unstained lid (representing the plain pine box) with plexiglass is hinged (a black hinge — all the hardware is black or is painted black with nail polish)) to the box. I decide to screw the box closed rather than have it displayed open. I re-write the two phrases that had been inside on the blue edges on the outside edges of the lid instead. 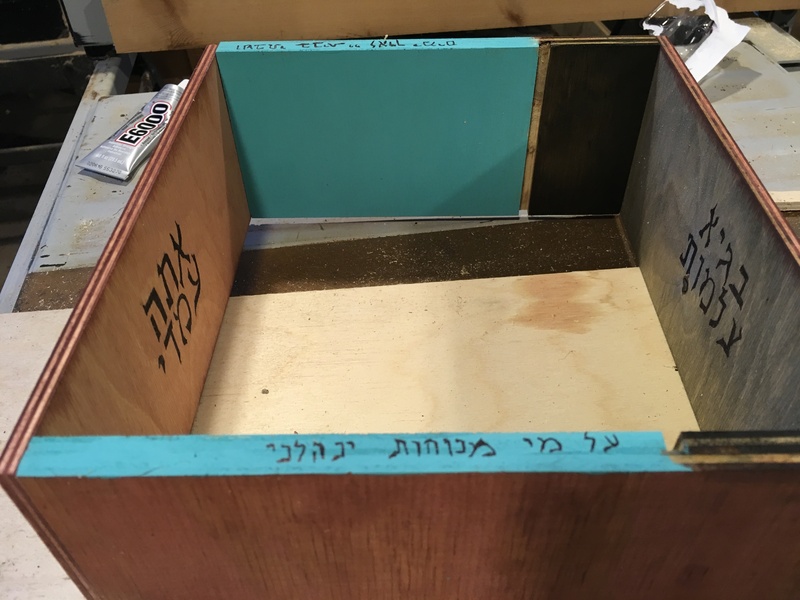 The bottom of the box has my signature in Hebrew and English, and is dedicated to my brother. 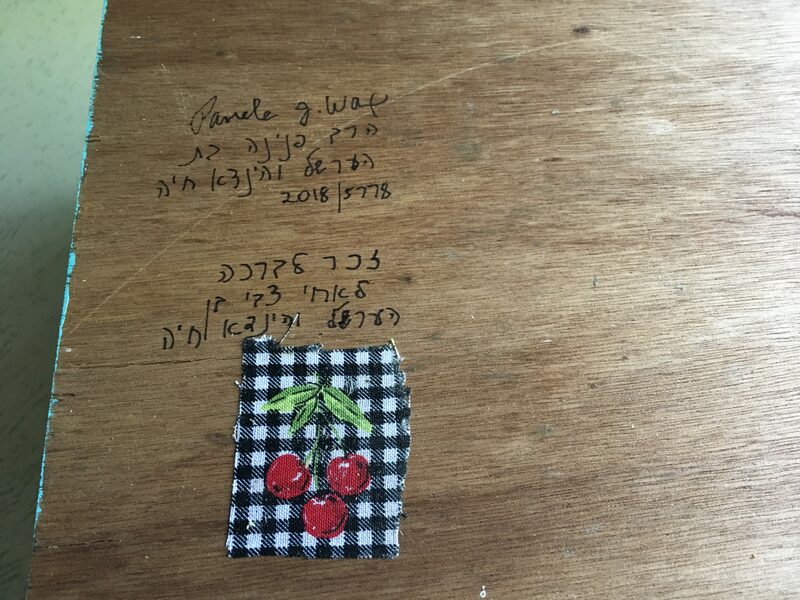 I also glued a piece of cloth depicting 3 cherries, as our grandfather referred to my sister, brother and me as his 3 perfect cherries. This is an earlier version of Keren’s piece. It may be relevant to know that her book is a rather mystical and shamanistic journey into her grief. 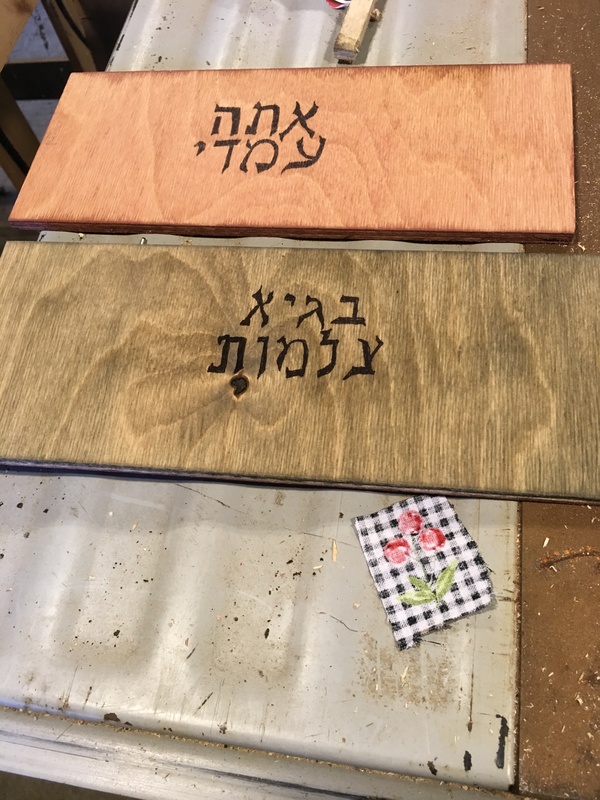 I am grateful to Chaim for his technical woodshop assistance! What a powerful expression of the pain of the one lost and the hole that is felt forever for those left behind. Thank you for sharing your heart-work with us, Pam.